Our county fair is this weekend and I’ve volunteered to be there lots and lots helping out with a country store. It should be a lot of fun, and if you’d like little sneak peaks of the action, tag along on instagram! I post there lots. I’m super excited to see how all of the things I entered into the fair were judged today too. I’m hoping for a few blue ribbons! 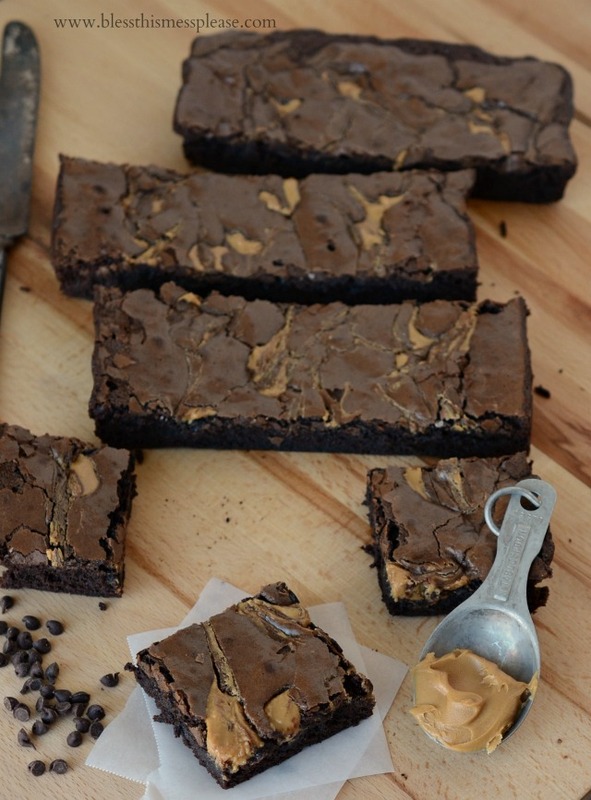 I thought I’d celebrate my fun weekend with you by posting this delicious peanut butter brownie recipe. It’s rich and chocolaty with just the right amount of peanut butter swirled on top. The brownies are soft and fudgy, just the way I like them, and they look amazing too. You could make these for an after school snack, Sunday night dessert, or to take to a party. There’s really no bad time to make these if you ask me. Preheat the oven to 350 degrees. Line an 8-inch square baking pan with foil, letting the foil over hang the edges by a few inches; grease the foil with butter or cooking spray. In a microwave safe dish (2-cup glass measuring cup works great for this), add your chocolates, cocoa, and butter. Microwave, stirring often, for 1 to 3 minutes until the mixture is smooth. Let it cool slightly. In a large bowl, whisk the sugar, eggs, vanilla, and salt together. Whisk in the melted chocolate mixture until combined. Stir in the flour until just incorporated. Scrape the batter into the prepared pan and smooth out the top. 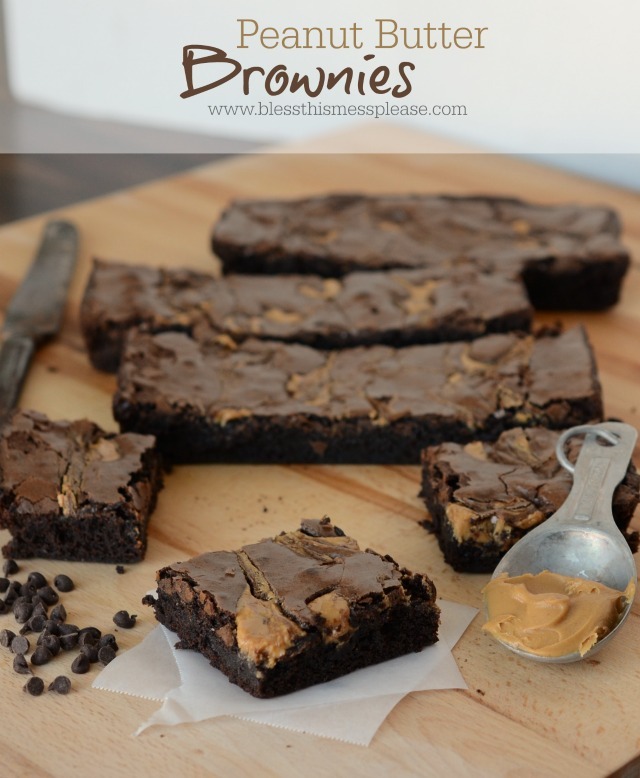 Drop the peanut butter on top of the brownie batter by little spoonfuls all over the top. 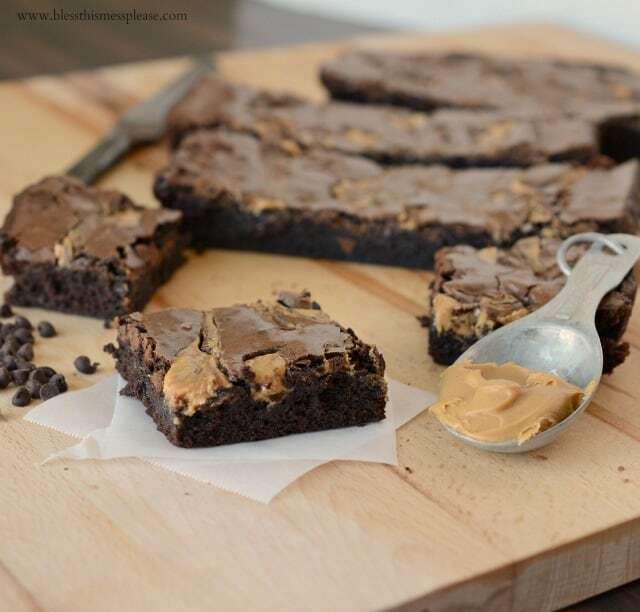 Use a knife to cut through the peanut butter and pull it through the brownie layer a bit. Bake the brownies until a tooth-pick inserted into the middle comes with just a few soft crumbs attached, 35 to 40 minutes. Let the brownies cool completely in the pan; set on a wire rack. Remove the brownies from the pan by using the foil, cut into squares to serve. I use the Ghirardelli’s 100% cocoa bars found in the baking aisle for the unsweetened chocolate. Man, it’s good! which is an awesome book! I LOVE brownies from scratch. How would you revise the recipe if I don’t have any unsweetened chocolate? Cut some sugar? Add more cocoa powder? Thanks for the recipe share. Hands down, I would say this is my husbands favorite flavor combination. He just can’t seem to get enough.